I'm half asleep so I'll keep this brief. I remember a story a friend told me about walking through the city after dropping a few tabs and waching the buildings lean over. Intrigued? Whatch the trailer! 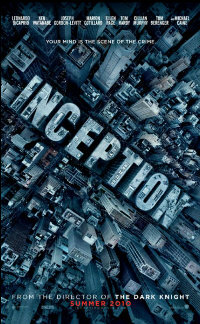 Also, check out this cast for Christopher Nolan's fifth effort: Leonardo DiCaprio, Joseph Gordon-Levitt, Ken Watanabe, Tom Hardy, Marion Cotillard, Ellen Page, Cillian Murphy, Tom Berenger, Michael Caine, Lukas Haas. Bring it! Trailer after the break. First teaser here. I'm not a huge fan on Nolan when he's in super hero mode but man, I can't help but get excited to see this. Looks mind-bending - just the way I like it.